The past 365 days has really been something else. My unspoken resolution for 2008 was to make it a better year, and to my surprise, it was better than I ever expected. After spending half of 2007 out of the country, I made it a point to see more of the Philippines this year. I had a list of places I wanted to visit, and though I wasn’t able to visit all of them, I was able to go to places I haven’t been to before. Polaroids are fun. Thank you Rotch for the film and the camera, thank you Kaoko for the scan! 2008 was certainly a year of domestic travel for me. My first trip out of Manila was to Tagaytay, a place that is so close to the metro, but I never explored. It quickly became a favorite destination, because after that first trip with my sister-in-law and nephews, I went back five more times afterwards, each time with different groups of friends. In 2006, most of my trips were done on my own. This year, I was fortunate enough to connect with people who share the same passion for traveling. As much as I love the freedom of solo travel, it was also great to travel with friends. From road trips to food trips, it was fun to share the experiences and memories with them. Not to mention the expenses! Paul‘s photo pretty much summed up our Chinese New Year celebration. 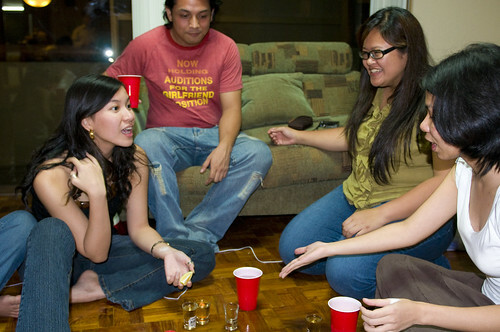 Definitely one of the most memorable parties of 2008. Click on the photo and read the notes and caption! It was also the year for festivals. Eric, who has a deep passion for the festivals of the Philippines, convinced me to join him for the Aliwan Fiesta in April. Despite complaining about the heat and the sudden downpour, I have to admit I loved the energy and the enthusiasm the dancers give off. That’s why in August, I flew with Eric and Melo to Cebu for the Pasigarbo sa Sugbo festival, and with Gail, Marc, Karla, Eric and Melo to Davao for the Kadayawan Festival. Of course, there’s the sponsored trips. Thanks to Geiser Maclang and their clients, I was able to discover the amazing art of Angono, Rizal, the best restaurants in Tagaytay, and the thrill of climibing Mt. Daguldol. I’m also grateful for Seair, for giving me the opportunity to see the spectacular natural wonders of Coron, the breathtaking sights of Batanes and the ever gorgeous beaches of Boracay. At Bag of Beans for PlurkLakbayan ’08. Thanks for the photo, Fran! So as another year comes to a close, I’d like to thank everybody who made 2008 one of the best years yet! a wonderful new year to you and your family! Awwww…me likes you too, Nina. It’s been so awesome following your adventures through your blog and Flickr and I can’t wait to see what EVIL you have in store for 2009. Rock on wit yo’ bad self! All I can say is, XD. …..Oh and happy new year, Nina! Here’s to more travels! Here’s to more adventures. Happy New Year! 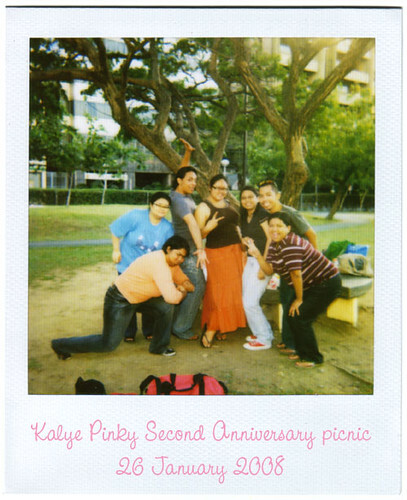 Very frutiful and fun year of travel din yung 2008! Wishing you more adventures in 2009! happy new year!